If you’re looking for a reliable fence contractor that serves Collinsville, Illinois, or a surrounding area, the best company to turn to is Chesley Fence & Deck. We are the most trusted name in the area when it comes to fencing, which is evidenced by the fact that, having served our community since 1967, we’ve installed more fencing than any of our competitors. Cedar fencing – We offer premium Western Red Cedar that is resistant to cracking and warping. We also use true 2×4 rails for enhanced durability. Vinyl fencing – This American-made fencing is more durable than similar products and has parts that fit together seamlessly for increased aesthetic appeal. To achieve the greatest possible strength, we set poles deeper than our competitors. Aluminum fencing – This decorative option feature screwless panels for a seamless appearance. It also undergoes an 11-step powder coating process to achieve unbeatable durability. As your fence contractor, we will ensure that you get the most value out of your new fence by ensuring a proper installation. Unlike many other companies we only use our own highly trained employees – not subcontractors – who adhere to our strict installation standards. 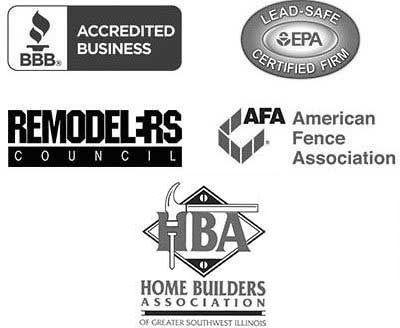 To learn more about why Chesley Fence & Deck is the finest fence contractor serving Collinsville, IL, contact us today.